My husband and I braved the crowds and caught the movie adaptation of Percy Jackson and the Olympians: The Lightning Thief last night, and I’ve got some words of advice for writer Craig Titley and director Chris Columbus: Look over Angela Ackerman‘s seven deadly sins of novel writing; they’re important for screenplays too. Now, I’m a big fan of Rick Riordan‘s novel series, but I know that movies and books are too very different mediums, and each has different needs as far as storytelling goes. But that’s just technique. Books and movies both need plot points that flow logically from one to the next, dialog that sounds authentic and characters that are unique and real. 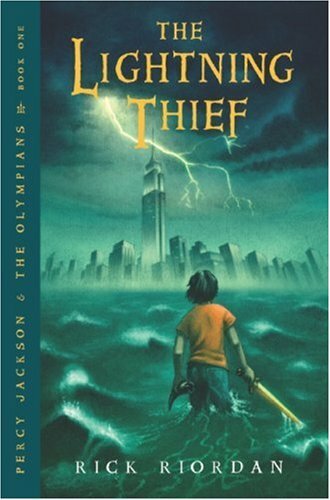 In the case of The Lightning Thief, the book has those, the movie doesn’t. It’s nothing new that Hollywood makes changes to books for the movie versions, and if it works for the storytelling on the screen and keeps the intention of the book’s story, I’m all for it. For example, Peter Jackson‘s The Lovely Bones begins differently than the original novel (although, Alice Sebold‘s brilliant original beginning is used in the movie, just at a different time) and this change works better for the movie. It keeps with the spirit of the novel but introduces the characters in a way that works better when the story is being told visually. Titley and Columbus made many changes for the Lightning Thief movie, but unfortunately, they don’t seem to be for the good of the story. Instead, and this is just my opinion — I, of course, wasn’t in the room when the Hollywood suits made these decisions — many of the changes seem to be for money. There are the obvious changes, like Percy using the reflective back of an iPod to battle Medusa instead of a glass orb and Annabeth dialing up Luke on her Apple computer for instructions on the flying shoes instead of using an iris rainbow message, which was the preferred form of long-distance communication in the book. But, I don’t think a glass orb and an iris rainbow would have yielded the studio much money in product placement fees. Sure, these are small changes, but then there’s the age of the main characters. In the book, Percy Jackson is 12; in the movie he’s 16 or 17. Why would Hollywood make this change? Maybe they thought older teens are the ones who come to the movies more and they wouldn’t be interested in seeing a movie about a 12-year-old. Funny, they were perfectly fine with paying to see a movie about 10-year-old Harry Potter. And it wasn’t just 8- to 12-year-olds who made the Percy Jackson novel series a bestseller. I read the books, and I’m … well, a lot older. Ok, so these changes were maybe perceived as necessary for the movie’s profitability. What about the characters? I fell in love with Percy Jackson for his goofy wit. He’s not a pretty boy who instinctively knows how to wield a sword and defeat a giant minotaur. In the book, he’s funny, clumsy, dorky and needs help from all his friends. And the fun about Grover in the book is that he’s not a big strong protector, even though that’s his job. In the book, humor comes because Percy protects Grover from bullies at school then finds out Grover is there to protect him from monsters. This also provides a character arc for Grover, who must overcome his fear to become a true protector. And what about settings? In the book, the kids have to battle Ares and Aphrodite in the tunnel of love, but in the movie, they battle a multi-headed monster in a replica of the Parthenon in Nashville. Kudos to Titley and Columbus for knowing about this replica (one of the great things about the Percy Jackson books is how Riordan blended the fantasy with real-life landmarks), but how did this change help the story, other than giving the Nashville Parthenon some publicity? Plot: It’s not logical that when they’re in the Parthenon and only have 30 minutes before the security guards are going to wake up that a) they would waste time dragging the rather hefty looking men into a side room and b) they’d boot up their computer and do a video conference so Luke can tell them Percy should run to make the winged shoes work. Wouldn’t Luke have told them that when he gave them the shoes? Dialog: One of the reason Riordan’s books are loved is because of the humor, but the funniest line in the movie is when the Hades guard burns the money Grover tries to bribe him with and Grover says, “We’re in a recession and you’re burning money!” Thumbs up to Titley for that one, but the other attempts at jokes fall flat, too obvious to be funny. Characters: Unlike the unique, flawed but heroic characters in the books, the movie’s characters one-dimensional and typical. Show don’t tell: In the book, we learn about Percy’s father and power as he does, revealed slowly. But in the movie, everything’s told to us up front, leaving us with no sense of discovery. There are other examples, but that’s not the point of this post. The point I’m trying to make is that great stories, no matter whether they’re written on a page or acted out on a screen, have things in common: logical action; interesting, realistic dialog; real characters making real choices to solve real problems, and learning something along the way. Here’s a message to Hollywood: If you’re interested in making a movie out of a book, that book most likely has a story that attracted you to it. Sure, translate the story. It’s wonderful, thrilling, to see the visual interpretation of a book you love on the screen. BUT, trust the book, trust the writer and agent and editor and publisher who worked so hard to make that book what it is, to tell that story so well that it made you interested in making it into a movie. Be true to the story the book tells, and you won’t go wrong. What do you think? Have you seen the movie? Did you like it, love it, hate it? I am so glad I found this post! I just got back from the movie and I am just so sad for poor Rick Riordan. I have never in my life seen a worse movie adaptation. As you say, almost everything from the book has been changed, and along with it, the magic of RR’s writing with it. The humor, the layered plot line, the fantastic scenes in which RR weaves greek myth into the 21st century (with a very few exceptions), all of these have been lost. I was especially disappointed that the makers decided to up the ages of the cast and spoon fed Percy all the info he needed. I found I didn’t root for him as I did in the book–there was no identity crisis over which God was his father, no sense of being adrift and not fitting in. It was all so rushed. There are just so many brilliant scenes from the book that got the axe. Getting into the underworld? Easy-peasy. And suddenly the plot is all about getting these pearls? A Hydra instead of a Chimera? And I really wanted to see that chihuahua turn into a Chimera, too! Whew. Sooo glad I could get that out. Thanks for letting me rant. And thanks so much for mentioning The Bookshelf Muse! I know, Angela and Ian. A very disappointing movie. I understand that movie adaptations are rarely the same as the book plot point for plot point because of time. Generally, subplots have to be cut to keep the movie within a two-hour timeframe. I get that. But there’s no reason to change the whole story, especially when you’re going to whitewash it into something far less interesting. Ian, they are planning to produce the other books, I suspect as long as they continue to make money. Judging by the sold out showings at our theater, the movie will make money. The studio suits have probably already greenlit the next one. The interesting thing is whether the movie’s success will continue next week after fans of the book hear about other fans’ disappointment. I’m predicting a big drop-off in week-to-week box office revenue, because it was the popularity of the book that built this opening week’s success. The strength of the movie itself will have to propel it on, and I don’t think it will. That said, this opening week revenue will be enough for another movie. Angela, my pleasure on mentioning The Bookshelf Muse. Your seven deadly sins of novel writing posts are fabulous. I’m following you on my Google Reader now and have put you in the blogroll here. If only those studio folks had read your blog, maybe Percy Jackson would have been a better movie. Of course, Chris Columbus should have known better. He did the first two Harry Potter movies. I’ve heard a lot of criticism about the control J.K. Rowling wields over how her books and characters are used, but I say good for her. Those movies are far better and far more respectful of the books than this one. Oh, and I would have loved to see that chihuahua turn a Chimera! 🙂 Also, Dionysus. He could have been hilarious. Well, I take back what I said about good box-office revenue. Despite sold out showings here, Box Office Mojo is estimating that Percy Jackson made only $31 million over the weekend, which isn’t that great for a movie like this. Maybe the bad reviews prior to release stopped some people from coming. Valentine’s Day made $52 million, and I know it was Valentine’s Day, but still. I think Percy Jackson should have done better based on the popularity of the books. Another thing to consider with box office sales is how they are billing it as ‘the next Harry Potter’. While I agree the book series is just plain brilliant and could be compared in some ways to HP, the movie isn’t even close. I was shocked to read your comment on how they are planning to continue to roll out the rest of the series. After how they butchered the end, not mentioning the Kronos angle at all, I figured they were planning on only the one movie. It will be interesting to see how it does in the box office in the coming weeks. Boy I would love to know how RR feels about his movie on the big screen. I’ve read that the studio is planning to do another Percy Jackson, but who knows if it’ll stick. It all depends on how well this one does. But, you’re right. With the changes they’ve made, they’re going to run into trouble with future adaptations. If they ever get enough movies to use the prophecy, they’ll have to either have the characters the same age in all the movies or change the prophecy to 21 or something, which just seems a bit silly. Sigh. Me and my wife saw it tonight with the kids. None of us have read the book, but we are big Herc/Xena fans so we’re familiar with a lot of the Mythological tropes, so we had fun waiting for each disaster to unfold. That’s great, Iapetus999. Yeah, try out the books now. They’re a lot of fun. I won`t watch a sequel if there is one, the movie was “apparently” made for a older public, but I see thing differently. The movie for me is for a younger public considering that all gods son are so full of themselves and the storyline is awful. The book greatest point was “how real life would be if gods existed nowadays”, the movie otherwise was unreal in every single aspect of the word.